Donald Trump and Kim Jong-Un came, and saw, and shook hands. They left Singapore with a deal in hand. The question is: Exactly how meaningful is that deal? The word "haters" should probably be excised from the vocabulary of anyone over the age of 12. Donald Trump is 71, and is the President of the United States. There's no way around it: Just that image is a pretty big win for both leaders. Kim, because he now has visual evidence of being taken seriously by the world's most powerful nation. Trump, because he can now point to something he has done that none of his predecessors did. After the handshaking and other niceties, it was time to get down to brass tacks and start talking. At that point, the proceedings began to hurtle toward their inevitable conclusion. 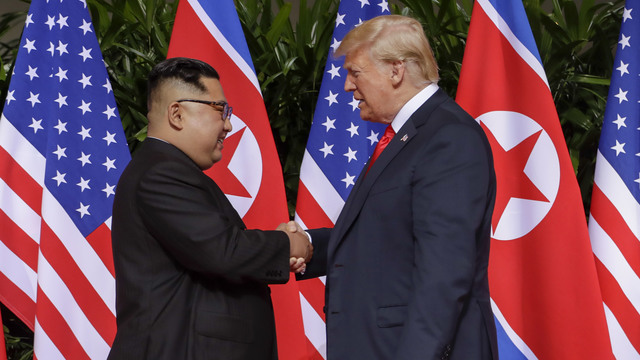 Kim needed to make a deal of some sort; he's got such a reputation as a flake and a welcher that if he didn't sign something, there wasn't going to be another meeting. Trump also needed to make a deal; he spent so much time talking up the summit, and he could not afford a second consecutive failure, after what happened at the G-7. Further, the "I'll know in one minute" talk, and the pre-summit tweet (above), and the fact that he kept teasing that "a deal is coming" throughout the negotiations committed him even more to a single course of action. The rest of the document is just flowery diplomatic language. In evaluating this agreement, let us first consider the two agreements that would seem to be most germane to the situation. The first is the Korean War armistice, which took two years of on-again, off-again negotiations, nine months of semi-intense negotiations, and two weeks of very intense negotiations. The second is the Joint Comprehensive Plan of Action (aka the Iran nuclear deal), where the timelines were similar, except it was six months of semi-intense negotiations instead of nine. Trump and Kim, by contrast spent about six hours together, and both of them left Singapore early (a decision they both made before their meeting even began). So, even before we consider the text of the agreement, the evidence suggests a lack of substance or serious diplomacy. And once we examine the provisions outlined above, we see that it is indeed a very Trumplike document: Big aspirations, little substance. Everyone wants peace on the Korean peninsula, and a reduction of nuclear weapons, and good relations between North Korea and the rest of the world. That's the easy part. But just like campaign promises about better healthcare, or 6% annual GDP growth, or a stronger military, or solving the opioid crisis, the hard question is "how?" There is, of course, zero "how" in Monday's agreement. Which means, oddly enough, that the most substantive item on the list above is probably #4, since that one has the potential to generate some tangible result in the near future. Although even then, one wonders exactly how many identifiable sets of POW/MIA remains still exist from a war that ended 65 years ago. It's been two days since Donald Trump left Canada, but the disastrous G-7 summit is still the talk of many towns. To start, there has now been time for some salacious gossip to leak out, courtesy of the New York Times. They report that during the discussions, Trump seemed to be uninterested, declining to wear headphones or an earpiece at times (particularly when Emmanuel Macron was speaking), and apparently even dozing off on occasion. Also, and to nobody's surprise, it turns out that Trump's advisers wanted him to skip the meeting entirely, fearing it would become a disaster. Which, as it turns out, was pretty good advice. The Toronto Star: "He sulked his way through the first part of the meeting, gave his delegation the OK to sign the summit's pallid final communique, then threw a hissy fit and tore it up as soon as he was back on Air Force One." The Globe and Mail (Canada): "Relations between two of the world's closest allies are now at a perilous low. The fault rests entirely with Mr. Trump and his advisers. Our government has been patient with the President and his protectionist agenda. So too have Canadians, but this is getting tiresome. We are a polite people, but the President will learn that, when roused, we don't roll over at the request of an insulting bully, no matter how big." Der Spiegel (Germany): "The G-7 debacle shows the real problem with Donald Trump's politics is Donald Trump. His behavior follows no order, no logic, instead just the desire to be the best, most important and biggest. The collapse of the West, the destruction of decades of friendship is simply a product of his unprecedented ego trips." Le Monde (France): "One thing is clear: the president of the United States, Donald Trump, is better disposed to the North Korean dictator Kim Jong-un, a man whose dynasty has locked his country and his people into a megalomaniac madness, than to his European, Japanese and Canadian allies." Liberation (France): "Donald Trump was ready with a smile for the G-7's traditional family photo, but for his supporters, this calm image matters less than the offensive attitude of an American president against the world, defending 'America First'." The Japan Times: "If U.S. President Donald Trump's objective is to make himself the center of attention at every international event, he is succeeding. If he aims to undermine the legitimacy of international institutions, he is making progress. If, however, he seeks to make America great again, his actions are working at cross purposes to his goal." The Guardian (UK): "A horrified European political establishment sees Trump, like Vladimir Putin, backing the populists of Europe, especially in eastern Europe, Austria and Italy. These are forces that threaten the liberal order in a way that Emmanuel Macron, Theresa May and Angela Merkel are only beginning to understand." The Telegraph (UK): "Trump's tactics suggest that 'the West' may be history." Under federal law, voters cannot be purged from the rolls for just failing to vote in one election. However, states can warn voters of an upcoming purge and if they don't respond, they can be removed from the rolls. Ohio took that to the max and the case ended up in the Supreme Court. Yesterday, Justice Anthony Kennedy and four of his best friends ruled that what Ohio did is fine with them. The other four justices (Elena Kagan, Sonia Sotomayor, Ruth Ginsburg, and Stephen Breyer) didn't agree, so it was the usual 5-4 decision. The case concerned Larry Harmon, a Navy veteran who voted in 2004 and 2008 but sat out 2012 because he didn't like any of the candidates. He also didn't vote in 2010 or 2014. As soon as he missed the 2010 vote, the state sent him a letter asking him to confirm his eligibility to vote. He claims he never got the letter. So when he didn't vote in 2012 or 2014, he was removed from the voting rolls. When he showed up to vote in 2016, he was politely but firmly told he was not allowed to vote. The case was about whether Ohio was too trigger-happy about purging people, especially when the 2011 letter might have been lost in the mail. The Court found that Ohio followed a reasonable procedure and Harmon's removal was constitutional. The case has clear political undertones because, in practice, it has far more impact on low-income, intermittent voters (who are largely Democrats) than on the older, more consistent Republican voters. In his dissent, Justice Breyer said that Ohio places far too much emphasis on the return of the 1.5 million notices it sends out every year to people who missed voting in an election. Well over a million recipients just throw the notice out and don't tell the state either "yes, I have moved" or "no, I have not moved." Very few of them realize that throwing out the notice and then not voting one or two more times will cancel their registration. Justice Sotomayor's dissent went down a different road. She said the Ohio procedure was clear evidence of yet another attempt by Republicans to disenfranchise groups that are overwhelmingly Democratic. The majority opinion basically said the Court doesn't care whether the Ohio procedure disproportionately affects low-income voters, minorities, and disabled people. All it cares about is whether Ohio violated federal law, and it didn't. Ohio gave voters who skipped an election a chance to redeem themselves and stay as active voters, and if they chose to ignore the warning and skip two more elections, then they are out. Other states follow a similar procedure, but Ohio has a hair trigger: It sends out the notice after a single missed election. Other states wait until the voter has skipped two or more elections before taking action. The fundamental problem is that when people move, they rarely deregister at their old address, so the states have no idea of knowing when someone has moved. So they interpret "don't like any of the candidates" as "moved or died." It's a crude measure, but absent a national database of where everyone lives (like nearly all European countries have), there is no other way to remove people who have moved or died from the rolls. Other Republican-controlled states will surely take notice of this decision and sharpen their procedures for removing voters now. Just won big Supreme Court decision on Voting! Great News! One of the ways Russian President Vladimir Putin may have helped Donald Trump in 2016 is by funneling money to groups that supported Trump. According to McClatchy, the Justice Dept. is now investigating whether top Russian banker Alexander Torshin (illegally) channeled Russian money through the National Rifle Association in 2016 to help Trump. Top NRA officials talked with Russians in Moscow during the campaign and investigators want to know more about what they said, because it is a federal crime for U.S. organizations to use foreign money to support candidates for public office. Under the radar (until now), Barack Obama has been getting a steady stream of potential 2020 presidential candidates stopping by for a chat. These include Sens. Bernie Sanders (I-VT), and Elizabeth Warren (D-MA), former Veep Joe Biden, former Massachusetts governor Deval Patrick, Los Angeles Mayor Eric Garcetti, and more. According to Politico's sources, the meetings often run for over an hour, with Obama giving advice and guidance. The talks range from philosophical ("What does the Democratic Party stand for?") to brass tacks ("How do I get donors to return calls?"). Obama has also talked with politicians who are definitely not candidates, including former senator Harry Reid and Sen. Doug Jones (D-AL). Some visitors have even given him advice. Sen. Chuck Schumer (D-NY) told him that the single most important thing he can do for the Democratic Party is raise gobs of money for the DNC. In ACLU's view, "no law" means "no law." Not "only a few laws," or "except laws that ban speech some people don't like." This strict nonpartisanship has gotten it (sometimes grudging) respect from politicians from across the political spectrum. The Trump administration is now forcing ALCU to change it's long-standing way of operating. Instead of waiting for Congress (or some state or local government) to violate the Bill of Rights and then suing it, the group is starting to become proactive and support candidates for office who promise to defend the First Amendment, no matter what. When Rep. Frank LoBiondo (R-NJ) announced his intention to retire, Democrats began to drool about their chances of taking his R+1 district. Then, the DCCC got exactly the candidate it wanted in moderate Jeff Van Drew, who is currently a state legislator, while the NRCC got stuck with a surprise come-from-behind underdog in Seth Grossman, a political newbie who is currently a lawyer. Grossman is a mini-Trump whose platform is anti-immigration, anti-Obamacare, anti-impeachment, anti-"fake news," and pro-gun. He'd be a pretty good match for, say, MS-02, or LA-02, maybe less so for NJ-02. In my view, the best way to bring diversity to the Republican Party is for Republicans to openly say that the whole idea of diversity is a bunch of crap and un-American...[T]he Constitution was designed to incorporate that idea of the Declaration of Independence that everybody is treated equally under the law. Now, what diversity has become, it's been an excuse by Democrats, communists and socialists, basically, to say that we're not all created equal, that some people, if he—if somebody is lesser qualified, they will get a job anyway, or they'll get into college anyway because of the tribe that they're with, what group, what box they fit into. It's fortunate that there is a wealthy, white man available to advise us all that skin color is no barrier to opportunity.